Could Sanctions Against Russia Backfire on the Dollar? Geopolitical catalysts for moves higher in precious metals prices – including air strikes on a politically deteriorating Iraq and an escalating war of sanctions between Russia and the U.S. (Vladimir Putin’s government announced it would ban imports of U.S. farm products) – are being dampened by superficially constructive economic data and relative strength in the dollar. But the dollar’s strength versus other currencies may be fleeting, and the dollar’s continued depreciation in real terms is all but guaranteed. The central banks of Russia and China moved last week to seal a currency swap agreement that will allow the two powers to conduct more trade in their own respective currencies. As Russia and its allies strategically move away from U.S. dollar-denominated trade, the dollar’s global preeminence figures to wane. The U.S. trade deficit “shrank 7%” according to some stories in the financial news media last week. Yes, the seasonally adjusted trade gap fell from the previous month. But the U.S. trade deficit for 2014 is still on pace to exceed 2013’s number. For the first six months of the year, the trade deficit totaled $371.6 billion – an increase of 4.8% compared to the same calendar period in 2013. Nevertheless, the perception that the U.S. trade deficit will narrow due to surging domestic oil production (and the potential for U.S. oil exports) helped keep the Greenback propped up last week. Gold and silver markets are trading sideways this morning after finishing mixed last week. The recent activity in silver bullion sales, might have to do with how silver prices fell for the fourth straight week, while gold found enough strength mid-week to finish in positive territory. For the past few months, gold prices have been oscillating around the 50-week moving average, within a narrowing trading range. The gold market is set up like a coiled spring, with cycles and seasonal tendencies pointing to the potential for a strong upside breakout before summer’s end. So far, however, neither gold nor silver have shown enough technical strength to get their moving averages all pointing upward. The gold and silver mining stock indexes are closer to achieving major breakouts on the charts; palladium spot prices already have. 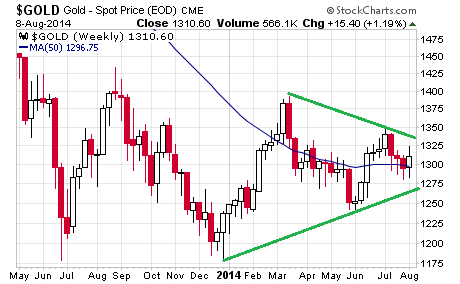 Gold and silver can be expected to follow.